1) Davidoff is celebrating 2013 being the year of the snake with a Davidoff 2013 “Year Of The Snake” Edition. The Churchill (7 x 48) features an Ecuador “701” wrapper around a San Vicente Seco binder and a combination of Piloto Seco, San Vicente Ligero, Piloto Viso, and hybrid 192 Seco/Yamasá filler. The cigar sells for $29.90 or $240 for a box of 8. Only 4,500 boxes are being produced. 2) Once again, Tampa’s cigar history comes alive with a festival celebrating the city’s rich heritage. Cigar makers, retailers, and food and drink vendors will be among those on hand for the Tampa Cigar Festival tomorrow at Cotanchobee Fort Brooke Park downtown. It lasts from 11 a.m. to 5 p.m., with a $5 admission fee. Part of the proceeds go to Southeastern Guide Dogs. 3) Inside the Industry: This year Nicaragua is expected to supplant the Dominican Republic as the top exporter of premium cigars to the U.S. despite lagging far behind the Dominican and Honduras only a decade ago. Habanos SA has named Walfrido Hernandez Mesa a co-president to serve alongside Buenaventura Jiménez Sanchez-Cañete. 4) Around the Blogs: Cigar Fan fires up an Ashton ESG 22 Year Salute. Stogie Review reviews La Musa by Emilio. Nice Tight Ash checks out a La Zona Espinosa. Tiki Bar kicks back with an Oliva Serie V Melanio. Cigar Inspector inspects a Fuente 8-5-8 Rosado. 5) Deal of the Week: Emerson’s Cigars is featuring a “Deal of the Year” with 20 cigars and a humidor for $99. Included are four each of the Vega Fina Fortaleza Toro, Trinidad Paradox Toro, Vega Fina Toro, Montecristo Platinum Toro, Romeo y Julieta Reserva Real Toro, and Montecristo Platinum humidor. Thanks for the link, Stogie Guys! 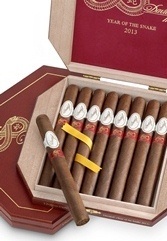 I'm really excited for the Davidoff Year of the Snake editions. I'm debating between one of those or one of the Camacho Liberty Series (http://camachocigars.com/cigars/camacho-liberty-2012/) to buy as gifts for some of my clients. Any thoughts?